1. Lie on your back with your hands by your sides and your legs extended. 2. Raise your legs and lift your hips, twisting them slightly to the left. 3. Slowly lower the legs without letting them touch the floor and then repeat on the right side. Keep your hands, head, neck and upper back flat on the floor, engage your core muscles and raise your legs and hips slowly and one vertebra at a time. Breathe out as you lift the hips off the mat and inhale as you slowly return to the starting position. The reverse crunch twist targets your abs and obliques and also engages the deep abdominal layers. This exercise improves core and lower back stability, defines the abdominal wall and helps to slim down your waist. If you’re a beginner practice doing reverse crunches first. 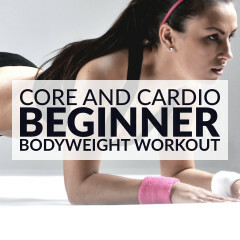 Once you’re comfortable with your form, advance to the reverse crunch twist and do 2 or 3, 30-second to 1-minute sets.